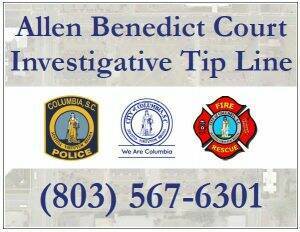 As the Columbia Police and Fire Departments (CPD) continue to investigate the two carbon monoxide deaths at Allen Benedict Court Apartments, a tip line has been established for residents to aid law enforcement in gathering information related to the on-going investigation. The tip line was established to create a safe space for residents to provide information or concerns to law enforcement. ** The tip line number is (803) 567-6301 and is for Allen Benedict Court residents who have lived at the property during the last year. When Allen Benedict residents call the number, they will hear a message from Police Chief Skip Holbrook with brief instructions. The phone line will not be manned, but CPD investigators will check messages throughout each day and contact callers to arrange a confidential time and place to meet, most comfortable to the tenant.